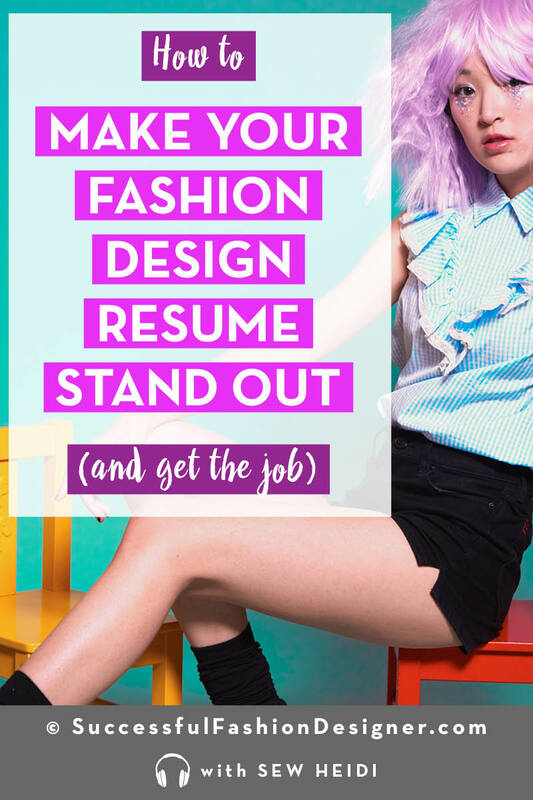 Getting a fashion design job can be really hard. If you’re an entry level fashion designer, it’s tough to present yourself and your portfolio without any real life work to show. If you’re experienced in the fashion industry, it’s hard to justify your worth. 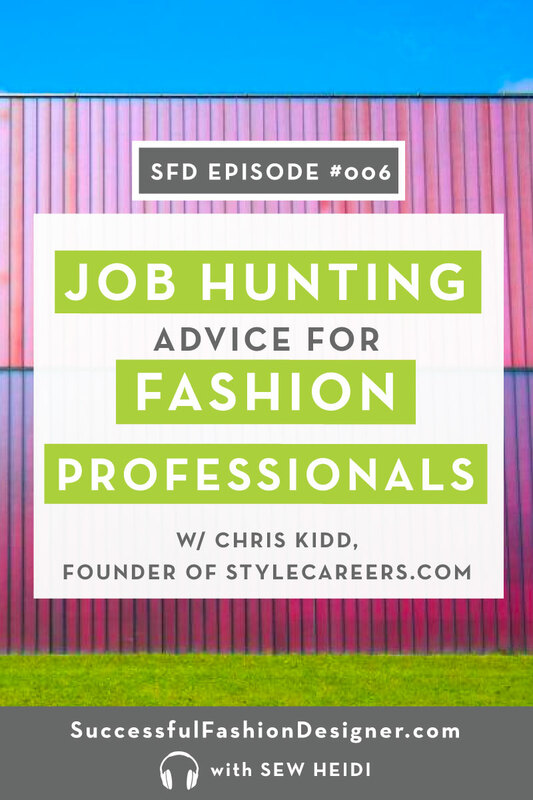 In this episode I’m chatting with Chris Kidd, founder of Style Careers, the largest fashion only job listing site. With inside access to fashion industry employers and exposure to job seekers at their career fairs, Chris has learned what works – and what doesn’t – in the job hunting process. We discussed the importance of presenting yourself as a modern candidate, what sectors of the industry are booming, and the most important information to include on your resume. 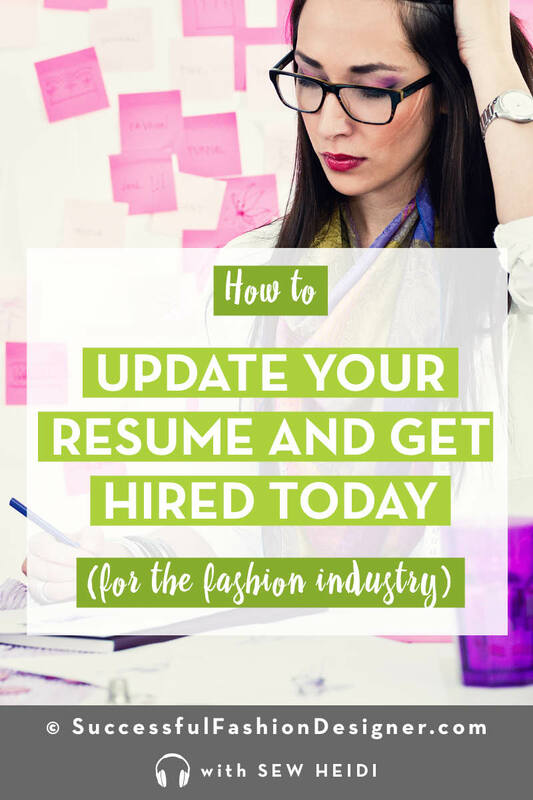 Get real life, actionable advice on how you can land your first – or your next – fashion design job. Heidi: Hey everybody this is Sew Heidi and you’re listening to the Successful Fashion Designer podcast. We all know that the fashion industry is brutally competitive and it takes loads of hard work to get ahead, the problem is that everyone’s secretive and tight-lipped about their ways. After working as a designer and educator for over a decade I wanted to help break down those barriers and bring you valuable knowledge from industry experts and this show is exactly where you’ll find that. Whether you’re trying to break into the fashion world make yourself more marketable launch your own label or become a successful freelancer we’ll help you get ahead in the cutthroat fashion industry. 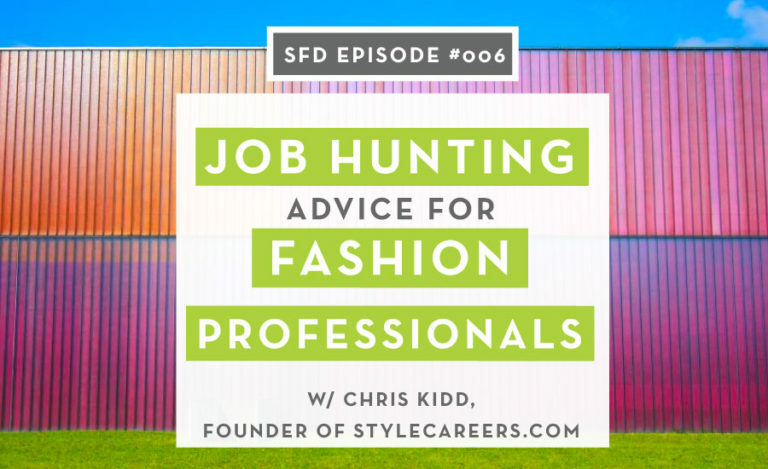 This is episode six of the Successful Fashion Designer Podcast and today I’m chatting with Chris Kidd founder of Stylecareers.com the largest fashion only job listing site. With insight access to fashion industry employers and exposure to jobseekers at their career fairs Chris has learned what works and what doesn’t in the job hunting process. Chris: Tell a company that you’re going to either make them money or save them money within the first few inches of your resume you have an advantage over other people. Heidi: We discussed the importance of presenting yourself as a modern candidate what sectors of the industry are booming and the most important information to include on your resume. Before we jump into the interview I want to remind you help the show out and make it easier for others to discover by leaving a rating on iTunes if you enjoyed this episode, I’d really appreciate it if you take 60 seconds to do that. Visit SFDnework.com/review to leave your rating. Thanks for your support and help. To access the show notes for today’s episode visit sfdnetwork.com/6. Now onto the interview with Chris. All right so first of all why don’t you just start by introducing yourself and tell us a little bit about who you are and what you do in the industry. Chris: Sure my name is Chris Kidd I’m the owner of StyleCareers.com. Style Careers is actually a family of websites and services with the premiere product being our job board for anybody who’s not familiar with StyleCareers.com we’re the largest fashion only job listing sites on the planet right maybe the universe I don’t know about you know other universities have job boards but that’s us at one point in time Women’s Wear Daily probably had I don’t know 13 14 15 pages of classified ads every Wednesday I don’t know if you guys are old enough to remember that but all those jobs ended up coming down Women’s Wear Daily just didn’t get the didn’t get the internet early on so what we found that niche. We also host career fairs in New York in LA we posted a little over 50 events our last event was just for designers a few weeks ago at the Pin Plaza Pavilion across from Madison Square Garden our next event will be in May. We also have a portfolio site just for the fashion industry it’s called styleportfolios.com similar to like Workupload and Behance but it’s just for fashion industry yeah and then we have a mayor of them all which is store level fashion jobs and style dispatch which is our kind of our careerist website or blog for fashion industry professionals. Heidi: Yeah and so for everybody listening I’ll put I’ll put your whole suite of sites in the show notes so everybody can kind of click through there and you guys really own this space and I know anyone looking for a job in fashion you guys are the first place that they go so thank you for creating this amazing resource for everybody. So I want to talk a little bit about like your original background. So you studied textiles at North Carolina State so it seems like at least at the college level you’re leaning into the fashion industry like how did that all get started when did you discover the fashion industry and kind of decide that a direction you want to go with your life? Chris: Yeah you know my accent turned off as a business major Texas A&M late 80s and I’m being honest I party my life right out of school and ended up moving to Colorado growing my hair long and living on my mountain bike for a few years. To pay the bills I started working in clothing stores right I was the you know for now is the story that’s not around anymore but it was you know it was a fast fashion kind of store was called the merry-go-round and I was the in-house new wave guy you know you have a new wave guy a hip-hop guy who can’t have a metal guy I was the new wave guy that told all the clothes to the new wavers right I don’t know what they call those people now but that’s actually how I got my start in the fashion industry and I moved up with the merry-go-round and you know got the point where I either had to become a professional retailer for the rest of my life this was when I was in my early 20s or I needed to go back to college and I didn’t want to throw away their retail experience so I ended up going to North Carolina State College of textiles so that I could take my store experience couple it with like an apparel manufacturing or background and then the plan was to eventually start my own label I didn’t work out that way but I you know I guess style craze was kind of a label it’s my company so yeah that’s how I got here. Heidi: And so and I pulled this off your Linkedin so I think it’s correct but you for a few years you worked as an account executive with a few different brands doing PLM PDM CAD and cam suffers and Technology so first of all for listeners who don’t know what all those abbreviations mean, can you give us a quick overview of that aspect of the industry. Chris: Yeah right, I was like when I was in school I was kind of drawn to the technology side of the fashion industry and while I was in school I actually ran the laser cutters and all the pattern making software in our apparel lab and through that I made contacts on the tech side of the fashion industry. So right out of school I got hired by a company called Animated Images, they were you know eventually acquired by another, anyway that doesn’t matter the big deal is animated images dead PDM software which is Product Data Management now that’s more than the PLM which is Product Lifecycle Management and it was the very early stages you know this is the middle to late 90’s it was the early stages of people tracking all of the product development and production and specs and costing and all that sort of stuff in one you know data center we weren’t even doing it online at the time it was you know more of a client server setup. Animated images job turn it into a job with lecture systems for those who don’t know lecture systems there either the number one or number two player in pattern making markers grading cutting a lot of you know high in CAD programs you know that sort of thing. Heidi: Yeah and so then after your experience doing that you founded Stylecareers in 2002 is that the correct date? Heidi: To kind of solve your own problem in a way? Chris: …and so yes style careers were actually created totally out of need. Heidi: So I mean I came into magical logistics of turning that idea into a reality but did you just start kind of just you start the websites, you start gathering jobs and putting them up there and then it grew into this like massive thing. Chris: You know, a lot of you know. Heidi: Reaching out and asking. Heidi: Okay so kind of shifting gears a little bit I’d love to talk a little bit about kind of the industry and people actually looking for jobs. So you know the industry is shrinking and competition is super tough and I feel like it just keeps getting harder and harder and so as you mentioned earlier you guys do hold a lot of career fairs to facilitate the hiring process for both parties and so from your experience at these events do you notice any trends in terms of what designers are doing to get ahead like is there something designers are doing or they have on their resume or they have in their portfolio that’s allowing them to get the job over the other person? Chris: …and so you know being active and understanding social media and professional social media and being up to date with you know the different tech trends definitely gives designers an advantage. Heidi: …fun, yeah, I’ve heard the desk turning into a thing and so it’s really I mean something I hadn’t really thought of but it makes perfect sense so it’s just presenting yourself in showing that like you’re keeping up with the space you have an online presence you know you maybe don’t have to have Twitter but like be on LinkedIn and just stay up to date because if you’re staying up to date with that and chances are staying up to date with other stuff in the industry I would imagine that brands maybe make that assumption. Chris: You know that’s absolutely the case and even if they’re not doing it over they’re internalizing it you know what I mean? I mean and it depends obviously what you designed for you I mean the designers at the Dress Barn are different than the designers at Elie Tahari right so you know you have to play to your audience and you have to play to the you know the you know the customer in a way you know I mean you have to present yourself that you know my customer is going to like this, does that make sense? 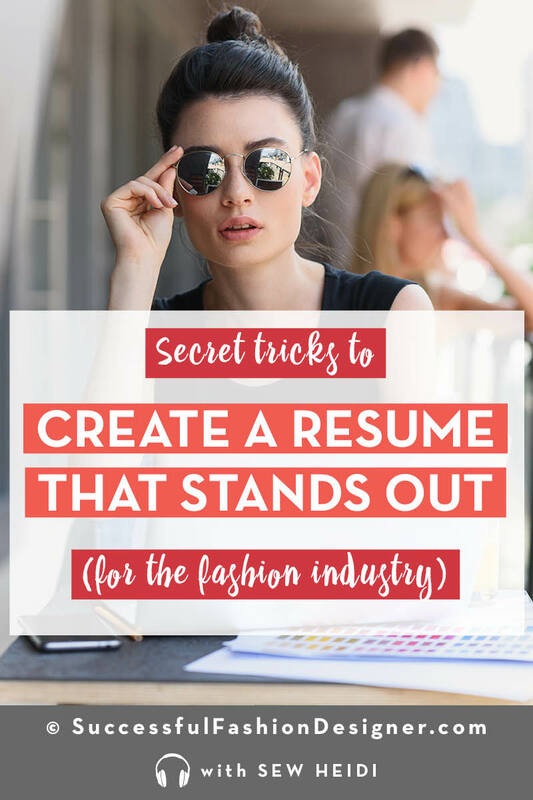 Chris: …obviously ahead of the trend but you know that a lot of that comes off in your social media and the way a designer might apply to a job or the way she might format a resume or presenter portfolio. Heidi: Yeah, interesting and so I’m curious in industry right now currently so it’s March of 2017 when we’re doing this recording and where do you see the most competition for jobs versus the biggest demand for employment? So like what jobs are a million people lining up to apply for versus what jobs are brands really having a hard time filling? Chris: Well and so that makes it one of the toughest positions to fill in the country other positions that are difficult to fill are you know some of the really specialized positions you know like a technical designer job not super hard to fill unless you need somebody that knows full fashioned knitwear you know what I mean? So then it becomes much more difficult you know a colorist isn’t that isn’t super hard to fill but you know the colors with 10 years’ experience there’s like 20 of them, in the whole industry you know what I mean? Chris: So and then you will get people that have like you know they’ll say we need a production coordinator that speaks Mandarin you know what I mean? So you start. it’s interesting you try to set proper expectations for our job board customers okay well how many people are going to do production speak Mandarin looking for a job and are willing to work for 25 grand a year you know and you start working backwards and there’s like eight people in the whole country that want to do this job you know what I’m saying? Chris: As far as jobs that people are lining up to do the you know if I was counseling someone younger in the industry I would have them embrace anything that has to do with e-commerce. Chris: I mean obviously you know that stores are closing and people are spending more money online so the online merchandisers that’s you know that’s a big job for us anything that has to do with you know getting the product on the site and sold through the site is in high demand, right? From product related positions you know a few years back it was really super hard to find pattern makers so hard that people don’t even make their own patterns anymore or very few people do you what I am saying? In very few companies there was a premium put on tech design but there tech design is even getting farmed offshore, right? Heidi: Yeah it’s a tough space right now, people are leaving. Chris: Yeah and it is especially tough for other job seekers like if you’re a designer and your late 30’s, 40’s, early 50’s companies don’t want to pay that much anymore right and so it’s not just about you know people presenting themselves as being on trend and you know tech forward and that sort of thing. They’re also you know a lot of companies are shying away from these people but you know because they just assume that they’re going to ask for a lot of money right and so you know it’s a definitely a difficult situation and you know for people looking for job, they got to take every advantage that they can. Heidi: And so this whole and competitive market and kind a like what you touched on is like okay this designer who’s she’s 45 and she’s asking for X salary versus this designer who’s 25 is willing to do it for X divided by you know 250 percent and so this kind of leads into this question I have about what Project Runway has done to the industry and so Project Runway launched in late 2004 and the interest in fashion soared like fashion school and fashion schools got flooded with applicants and just more and more designers were pumped out every year and I think that’s continued to happen and so how have you noticed the shift in that market with all this young talent willing to work for lower wages because they’re just happy to get this job to work in fashion to have this like amazing line item on their resume and how have you noticed a shift in the market with that happening in industry? Heidi: It does make sense. Chris: …and we preach this a lot to people is you know most you know this is more it’s more obvious or it’s more prevalent with younger designers or younger professionals but it’s always like a money equation with any sort of employment you, know what I mean? Candidates are selling labor and you know employers are buying that labor right and they want to make a profit on the labor right and so a lot of the designers a lot of the professionals that stand out they it’s easier for them to sell their return on investment to potential employers. Sure I’m 50 percent more expensive than this person but this is what I bring to the table, that make sense? Heidi: It does make sense. So what if you were advising someone what would be the things you could tell them to and to help show their ROI, Return of Investment. Chris: Yes, you know working with experienced job seekers it’s important that they you know have either things they need to have a modern resume to begin with right so rather than having like an objective statement or even a summary statement, they need to have select accomplishments and then they in this you know in this first you know few inches of your resume you really need to be able to sell your labor so you have you know bullet points with you know increase sales by 25 percent, design something that you know made X amount of dollars saved X amount of dollars by instituting new process whatever it is you know like if you can tell a company that you’re going to either make the money or save the money within the first few inches of your resume you have an advantage over other people. Chris: You know what I mean? Chris: …and it’s an equation like this is how much your labor cost that’s how much I want to make on that labor so if you can prove that you’re going to make you know you know X times your labor then you have a better chance of getting the job. Heidi: Yes providing this data driven content and it’s something that like I talk about a lot with other aspects of my businesses and stuff that I do but it’s this whole it’s not just about presenting this beautiful portfolio and all these pretty pictures all these great designs that you did but like what are some of the numbers like show me what maybe you decrease production costs by five percent but that adds up to a lot right or in decreased production time or you created the style and sales soared. So show those numbers right up front and that’s really tasty for a brand to see that. Chris: No, that’s what I mean if it was just about the art we don’t you know we just be artists, right? Everything’s gotta be sellable, everything’s got to have a you know it’s all going to be monetized and so if a designer or any sort of you know fashion professional can show how they can make a company money or save a company money it’s huge. Heidi: Yeah, so on the topic of like just the tough competition and finding jobs and opportunities and obviously. There’s a lot of opportunity in New York City and LA obviously as that’s where you guys hold your job fares there’s also a lot of competition there. On top of that there’s brands that are located all over the US and internationally and all these I’m going to use air quotes here but like all these random locations but you never think of and I hear many designers say things that I have to live in New York City or I’m afraid to live in New York City that I won’t be able to get work elsewhere do you notice a difference in competition for jobs some let’s say New York to LA versus all these other places? Chris: …and so the companies in New York and LA they can be more selective and they can pay less relative salary because you know if you apply to that job there might be 20 people just as talented as you that also applied to the job if you’re applying to a job in Landsend the chances are you don’t have a lot of competition. Chris: Outside of Madison, like Dodgeville Wisconsin. Chris: Yeah and then you know on the tough part for you know a designer you know what if that job doesn’t work out and you moved your family to Dodgeville right? So now you got to move again to find another job it’s the same way I’ve got a cup you know good customer are ours as Chicos great company you know you go from New York to Florida you save 10% just on state income tax right but if things don’t work out you got no place to go. Chris: So that’s a challenge you know there’s a few companies in Miami so you know you’ve got a couple different options, there are a few places in Dallas so if you move to Dallas you’ve got a few other options right but anymore everything is New York in LA. Chris: San Francisco to an extent you know what I mean? Chris: …and now there’s nothing. Chris: Just dies, as a matter of fact our office is an old yarn manufacturing facility. Heidi: Oh is it really? That’s so fascinating it’s a very cool space. Okay so you touched on this a little bit but like as a blanket statement I mean you’ve been doing Style Careers for 15 years so that’s a very substantial amount of time you’ve seen a lot of ups and downs and what have you seen what are some the big shifts in the industry and job opportunities that you’ve seen change over the last 15 years with the advent of let’s say the internet or just various places the economy has been in you know what are some of the big changes you’ve seen? Chris: Yeah you know there’s been a general, you know the changes are kind of regional you know what I mean? So for instance in LA, they still manufacture it but they manufacture less in New York they haven’t been manufacturing for a really long time right? Megatrends you know a lot of things are moving towards I mean there’s so much more emphasis on online marketing and Merchandising it’s so much you know it’s such a big part of you know things that are done today that you know wasn’t even a consideration 10 years ago or hardly a consideration. Merchant’s positions like planners and allocators you know five or six years ago those were premium positions that people had you know are having a hard time to fill well now that companies have fewer stores you need fewer planners and allocators, right? And so those are less there’s less of a premium on those types of position, you know there’s an emphasis a lot on you know technical tech design still has a large emphasis because everything’s being manufactured offshores right and so sort of the stacks have to be tight but we need fewer tech designers than we did 10 years ago because the technology is better right there’s less people chasing data points you know that’s mainly it. There’s a lot of interesting things and as far as ebb and flow goes of the way people apply to jobs. For instance right now if you are a designer and you hate your job and you want a new job you may still be afraid apply to another job because the job that you have right now is harder to replace than it was five years ago, does that make sense? So people even though there are people that want to get out of the job that they have they are less likely to apply to new jobs in fear of somebody that will find out that they’re looking for a job but in the job that they have is more precious to them because it’s harder to replace right now and so we actually see applications total applications go down when the economy is a little tight, right? Heidi: Oh, because so they’re nervous that if they sort of find other jobs that they’re they might get found out by their employer and then they’ll get pushed out and then they won’t be able to find something am I understanding that right? Heidi: and you’re blindly sending your resume out. Chris: …and you’re really afraid to apply. I’m sorry. Heidi: …you have no idea where it could be the company you’re working for. Chris: Yeah it’s completely opposite of what a lot of people think all right? Chris: …but it all it all comes down to what’s dear to that person you know if you can’t replace your job even you’re not going to apply to other jobs. Heidi: Yeah, so okay for like a really action item question here, if I’m a designer and I work at company and I’m really unhappy how could I comfortably go about applying to or exploring jobs at Company B and C and try to feel confident that my company A is not going to find out, can I ask them to not contact my current company or what can I do? Chris: Well you know what you before you do that, before you even apply you’ve got a research of the companies and it depends on what industry you’re in, you know what I mean? So for instance and like men’s wear like let say in men’s sportswear where they’re men sportswear companies are owned by either a really large company or a lot of disparate individuals disparate you know I mean like there’s not a lot of networks right but if you’re to applying to a children’s wear position about 75% of all the children’s wear companies in New York the owners are related somehow they go to the same church or whatever you know what I’m saying, like they’re all it’s a network and you know if you apply to a job at you know one of the cousins companies your employer is going to find out about it you know what I mean and so a lot of you know the first thing you got to do is you got to research the industry right. The second thing is you know you were well within your rights to apply to a job and ask that they you know they, the person that you’re applying to, to keep this confidential. Most are going to do it anyway you know what I’m saying? Heidi: But that is fair right like that comes off very much? Chris: That’s totally a fair request. Absolutely. Heidi: Because I feel like it could come off as like it could rub them the wrong way but it comes off fair. Chris: …you know what I mean? You know you’re looking for new challenges, you’re looking to move up, you know you always put a positive spin on it even if you hate that place right? Chris: You know you always want to be positive and you know and use positivity to kind of you know ask that question like “hey you know please don’t share this with anybody you know I don’t want hurt any feelings we love everybody” that you know anything you just want to be positive with everything. Chris: I think I did touch on this but listen I’m assuming most your listeners are designers or touched design in some way, right? Chris: …and so when you think in terms of what you’re designing I mean right now there are no power brands at least to my knowledge that absolutely everybody’s got to have you don’t even to like 2007 everybody had to have a pair of $300 jeans that was made in the artisanal factory in LA you know what I’m saying and you know what is that brand now well Rock and Republic saw the coals right? Chris: Juicy Couture is you know like owned by a brand management company I think it sold it like all discounters right? Chris: But in 2007 it was a huge brand and people felt compelled like I had to have these things right and so you know there are only so many pair you know we can only sell so many pairs of tight black pants to women before we go out of business, right? There has to be something compelling and I need designers to take risks and to take chances and to make things that are going to compel people, right? To make them want to buy these things. You go to the malls or you go to a shopping center and everything is very bland right now and that’s partly because we’re retailers their business is down so they don’t want to take chances on things so they buy basically what sold last year. Heidi: The try and trail. Chris: Yeah and so we’ve got to get to a point to where the industry has to be shaken up or we’re going to be in this funk for a while. All you have to you know people need to design things that make kids hold off a year on buying a new iPhone, right? Chris: Of these purse or these shoes or whatever it is or you know what I’m saying. I mean people have to get out of the comfort zones I got a you know there really has to be some sort of there’s got to be people have to take chances you know what I’m saying? Chris: …we need people to be less bland. Does that make sense? Heidi: Yeah but those risks are scary to take and then if it fails then that really hurts. Chris: It absolutely does and you know it’s unfortunately until I think my you know just personally until we’re until we understand that we’re competing with you know personal electronics and streaming services and all these different things that aren’t you know apparel or accessories related we’re going to stay in this funk if the industry is going to continue to contract. Heidi: Yeah, you know that’s a really interesting perspective and you’re the first person I’ve heard bring that up but it’s absolutely valid point. Chris: You know if you’re if you’re a 20-something guy you’re you know you have a blue hoodie and a white hoodie and a couple different t-shirts right there’s nothing compelling to make you go out there and buy a different shirt. Chris: Well exactly you know I’m saying like it’s got to be stuff that people have to have and they don’t know that they need to have these things yet. Heidi: And so it’s a matter of figuring out what is that item like how do you discover what it is, it’s a tough question. Chris: Yeah and you know buyers don’t necessarily want to take chances right now we need designers to take chances then we need buyers that take chances on those designers you know what I’m saying? Heidi: …or it’s this whole other market of like direct-to-consumer so these independent designers kind of starting up something on their own and you know skipping the hole, which is obviously has it’s all of its own challenges of you know finding your audience and getting people to buy your product and getting them to know your name but you know perhaps that’s where it will come out of. Chris: …cuz it’s the industry’s definitely in a funk. Heidi: Interesting. I love it. Okay so I will end with the question that I asked everybody at the end of the interview. What is one question you always wish people would ask you about working in fashion but don’t ever ask you? Chris: You know what, I don’t feel that I really work in fashion I know all of my customers are very fashionable companies and all the people that use our site are very fashionable I really don’t have a good answer for you on that one. Heidi: Okay, oh that’s fair that’s a tough question. Chris: Yeah. We’re not the type of company that would ever be involved in like a photoshoot or with models hanging around or you know does that make sense? Heidi: It does that but you’re obviously still very engaged with the industry and very knowledgeable in the industry as a whole and so perhaps fashion was not the right word perhaps the industry but let me rephrase that then, what does one question you always wish people would ask about your company that they don’t ask about your job, your company, your brand? Chris: You know I like – look I like I wish people would talk about you know and we touched on it and it’s why people applying why they don’t apply and you know people I like to talk to people to set proper expectations you know we’ll have people that all they want we had a company complaining about the applications on an account executive for a luggage company right, well the interesting thing is I think well you know people are out of work you know why don’t I have you know 200 applications well okay well how many luggage brands are they and then how many of those luggage brands are owned by you know licensers like so for instance company A owns brands one two and three right so you only need one salesperson for that company then they have like a bunch of different brands, anyway when you start working backwards you know okay how many people how many account executives actually sell luggage right and then you go backwards and how many are in this particular part of the country and how many of them you know sell the beans particular outlets right so now you you’re looking at something you think where you should get like a hundred applications there but they’re probably only 20 people that do that job in the entire country and then of those 20 people how many are looking for a job right and so those are kind of things that are kind of interesting to me right now as far as you know filling the needs of people because a lot of recruiters have a tendency they don’t think in terms of the market if that makes sense and they don’t think in terms of you know how many people actually do these positions and so they think oh I only got eight applications for this job well there’s only you know twenty five people in the entire country did that so really I got to about thirty percent of the industry to apply that’s really good, right? Heidi: Yeah just like going back to the whole number thing that we kind of touched on earlier is like this whole backwards analysis of like you know here’s what you got and then how did you actually get there and why did you actually get there and I think the same could be said for the companies and like why are they asking why they did not make the right applicants but as many as applicant as they thought and then same with the designers who are applying to the jobs, why are they not getting the interview, why are they not hearing back into the whole concept of like backwards analysis of okay why is this happening, what could I do to maybe change or shift that so maybe for the companies it’s like okay could I widen the pool of people that I’m going to look at maybe you don’t have to have these specific expertise they’ll kind of open that up a little bit and for a designer not sure what that would be but just like how they can start getting more applicants and or start getting more interviews and analyzing what happened and why it happened? Chris: …look like an objective statement or something like that or you know their summary on their LinkedIn profile is very focused and it you know it keeps them from getting jobs does that make sense? Heidi: It’s too niche, it’s too narrow. Chris: …and you know where they might you know maybe they should wrap in you know instead sell their return on investment as opposed to selling I do this one thing and I do it really well. Heidi: Show what the results they’ve gotten. Heidi: Yeah I thought that’s a great high note to end on in a great tactile strategy that someone could take and run with like right now listening to this interview to help land our next job. I love it awesome Chris this was so great you have like five or six sites I will make sure to put those all in the show notes for everybody listening on and that way they can find you and all the great services you offer thank you so much for your time is really great to chat with you. Chris: It’s nice talking to you thank you very much. Heidi: Thank you for listening to episode 6 of the Successful Fashion Designer podcast if you’d like to learn more about any of the resources mentioned in this episode visit the show notes at sfdnetwork.com/6 – and since you made it this far you must have liked the episode if you can take sixty seconds to leave a review on iTunes it helps the show a lot and makes the podcast easier for people to discover it’s super easy to do and I’d really appreciate it visit sfdnetwork.com/review to leave your rating and thanks for your support and help. SFD053: 4 Best Practices for Fashion Job Search Success, with Recruiter Shellie Simpson SFD029: Fashion Career Advice for Ambitious Designers SFD072 This Fashion Designer Applied to Puma 7 Times. How He Finally Got His Dream Job.